With brilliant flowers in an increasing colourful range Osteospermum are widely used in landscaping both as ground covers and for feature plantings. Drought tolerant Osteospermum are a long flowering plant excellent for use in a number of landscaping situations. Growing with a natural bushy habit they will reach 30 – 40 cm in height and spread to around twice that. Newer cultivars being offered have a more compact growth habit reaching around 15 – 20 cm, these types are suited to growing in containers as well as hanging baskets. All have daisy like flowers. Landscaping use is enhanced by the drought tolerant nature, long flowering period and low maintenance. In fact they can be pruned with hedge clippers if required. 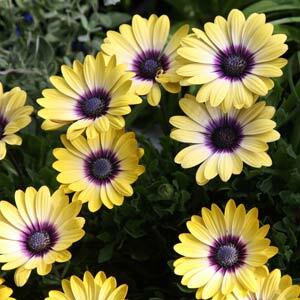 Also known as the African Daisy or Cape Daisy, they are available in a range of colors from brilliant yellows and pinks through to muted pastel tones. Wholesalers offer these plants in tray as well as larger specimens in pots.